Welcome to your special Member's Only content! On this page, you'll find all your bonus materials, which will include various video tutorials and other supportive files for your Maxie Mail Subscription Sewing Box. Be sure to come back here each month to retrieve your information. And remember, you'll have access to this page for as long as you are a subscriber! I had so much fun working with this little tumbler shape and was very surprised at its versatile design capabilities! I settled on this pillow or quilt for our project, with four different layout options. The main option, and the one demonstrated in the video is “Lava Lamps”, hence the pattern name. But just look at these other, larger versions that use the very same layout! (See image, above.) I worked these designs (and others) in Electric Quilt, so if you have that software and would like my layout instructions, click here! If not, click here for a coloring sheet! (Or click the image to download.) Print as many as you like for your personal use, and please share your creations with me! Art Gallery Fabrics 100% Pima Cotton for pillow top and envelope pillow back. Fabrics are by Bari J, Sew Caroline, Sharon Holland and AGF Studio. For quilting your project: Moda Muslin and Warm & Plush batting from the Warm Company. The Twiggy Tumbler acrylic cutting template. True Grips Non-slip Adhesive Rings to keep your template steady! How to cut and sew tumbler shapes efficiently and accurately. How to measure and cut quilt borders - the easy way! You’ll notice a little different format for our videos this month. We made two videos, one as a box content review, and the second as a separate tutorial for the specific project. You’ll want to watch both, as helpful instructions are included in each. I felt that it would help streamline your time to be able to go directly to the instructional video when you are ready to sew. This would also allow me to share the content video in a public manner with those curious about Maxie Mail, without disclosing the tutorial. No password is needed for the first video. The password for the second video is printed on your pattern, front left, top paragraph. Thank you for subscribing to Maxie Mail! I love sewing with you each month and enjoy the connections we’ve made from all over the world! Twiggy Tumbler Tutorial - Password is found inside your pattern, front left, top paragraph. Hello, everyone! Welcome to your February content! I have to thank you all that participated in our ‘February Friends’ event! You blew me away with your kind referrals, and many ‘thank you’ surprises went out in boxes this past week. I’ve come to feel on a friendship basis with many of you and I deeply appreciate every single member! Our boxes are also shipping to many countries outside the USA, and the connections I feel, both home and abroad, are very meaningful and rewarding. If you’ve ever shied away from the ‘Y’ seam, this month’s project may have you shaking in your boots! But just be patient, brew that tea and watch both of the short videos below while you are sipping. I think you’ll find sewing hexagons not only easy, but very fast and fun! We are making The Honeypot Table Runner, a spin-off of a project my daughter, Bonnie Christine, and I designed for Art Gallery Fabrics. That pattern is a free download, (see below) and since I am including my Honeypot Acrylic Template in your box, I have a feeling you’ll soon be busy as a bee! With no hexagons to cut and no blocks to piece you’ll get straight to the fun! With fabrics so perfect for spring & summer, or birthdays, babies, weddings and more, you’ll be sure to find it on your table often! 36 pre-cut Hexagons in Art Gallery Fabrics’ Reverie Fusion line, including Bonnie Christine and Sew Caroline designs. What you’ll learn: In this month’s video I share how to perfectly sew a ‘Y’ seam so that it lies flat and smooth. You’ll learn how to spin your seams on the back side of the quilt top to further ensure flat seam allowances. You’ll also learn about hexagon grain lines and which side to sew first. Let’s get started! Please watch the videos in order below, because I share important information about the contents of your box and sewing tips in the first one. The second video will teach you my technique for sewing hexagons together for a perfect, flat ‘Y’ seams! And…just in case you might be inclined to wish for a Honeypot Pre-cut Quilt Kit, you’ll find a couple of colorways here! One more thing…need help with binding your quilt? Click here for my video tutorial. The Honeypot Table Runner - no password required. Let’s Sew Hexagons! - No password needed. Before we get into our box project, I have some news to announce! February, which is the perfect month to share a little love with your friends, marks our 2nd Annual February Friends Month! Refer a friend to Maxie Mail, and when your friend subscribes, request that your name be placed in the ‘Referred By’ field and you’ll both find a surprise tucked in your February box! And…there’s no limit! You’ll receive a gift for every referral! Offer good through February 22, 2019. Thank you in advance for sharing your experiences with your friends! This month’s project is filled with many skill building techniques! The video always has much more information beyond the written pattern, so be sure to watch. You’ll learn how to use the Log Cabin Trim Tool by Creative Grids© as you create your Island Cabins quilt. This tool is fool proof, and although the finished strips look small, you won’t be working with narrow cuts! All your strip cuts will be 1 1/2” wide, with the exception of border and binding. Island Cabins is a bit unique for a log cabin setting, as the blocks are set ‘on point’. With tricky bias edges, you’ll learn how to correctly cut the required setting triangles for this type of layout, and I’ve created a downloadable Setting Triangle Chart for you to keep as a reference! Quilt borders can serve the wonderful purpose of bringing our quilt tops back into ‘square’ and must be carefully cut. You’ll learn how I accurately fit borders with no measuring! We’ll talk about fabric ‘values’ (color, shades, hues and how they work together). Pressing, labeling your cuts and much more…in the video! 100% Pima Cotton Fabrics* by Art Gallery Fabrics for quilt top and binding, from designers Barij and Sew Caroline. *The pre-cut 10” squares need to be trimmed to 7” square, and the 5” squares need to be trimmed to 3 3/4” squares. Your pattern includes additional cutting instructions for all strips. Brew that tea and let’s get started! Thank you for your subscription to Maxie Mail! I hope you enjoy sewing with me. Island Cabins Video - Password can be found on the inside right side of your pattern (inside your box). Click the image below to download your reference chart! I hope your Christmas was a merry one! With those Christmas festivities behind us I thought it might be a great time to de-stress with a sweet little project just for you! 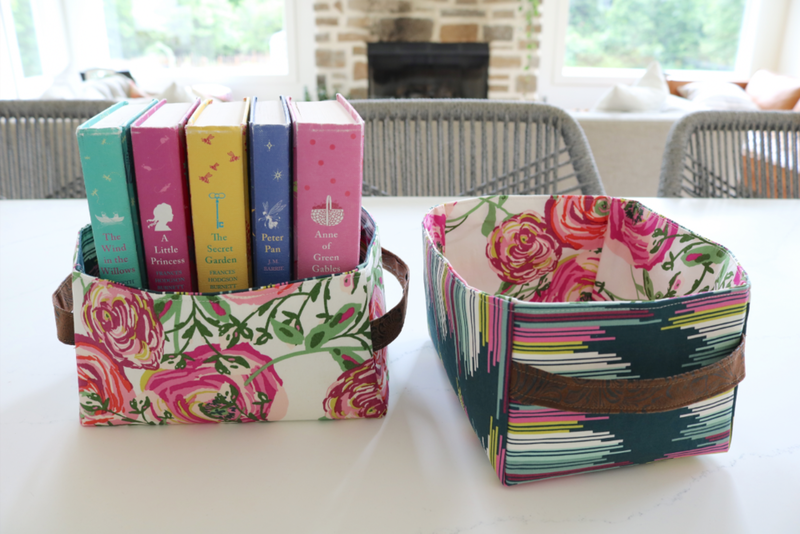 This month we are making a beautiful needlebook, but it’s so much more than that, with a bundle of storage possibilities for your portable sewing projects! Everything carried inside is kept safe and sound, with pockets, ties, ribbon and elastic, and the best part is that you can customize the inside for your favorite notions! Not only are you receiving all the fabrics and ribbons, elastics and ties, you also receive a beautiful pair of embroidery scissors and the sweetest Hummingbird Needle threader! Everything you need to complete your project is tucked inside your box, even the fusible batting, which was graciously supplied for you from Quilters Dream Batting! I love this particular batting because of the softness after fusing. It’s particularly applicable in this project because the lining can be fused in place so that there is no shifting when quilting, and if you choose to make the unbound version, the fusible batting will hold the finished lining in place and keep the book very stable. This batting would be a great choice for bags, pillows and more! Quilters Dream has also supplied a sample card for you. I hope your new year is blessed beyond measure! Next month’s project brings you a traditional quilt block with an unusual setting, and a foolproof construction method! Thank you for your subscription to Maxie Mail! Quilt Binding Tutorial - No Password Needed! December 2018 - 7-Way Mobius Scarves! This month’s sewing project is dedicated to my beloved Mother, who passed into heaven just yesterday. She instilled so much in me, including her love of fabrics and sewing. She was strong, tenderhearted, kind and loving, devoted to her family and to God. I’ll be thinking of her every time I step into my sewing room, or see a beautiful flower garden or attempt to make Thanksgiving dressing as good as hers. I loved her fiercely. This photo was taken of her at age 84, holding 1/2 of her portrait at 18 years old. The fabrics I chose are 100% Cotton Voile by Art Gallery, designed by Katarina Roccella. Cotton voile is sheer, billowy and soft, which makes it the perfect choice for a year round scarf for all day wear. I’m sure you’ll enjoy working with this exceptional fabric every step from start to finish! French for veil, the proper pronunciation of voile can be heard here, but being from the southern part of America, my pronunciation rhymes with foil, and I can almost make it into a three-syllable word! Along with the pattern and information card, special items to complete your project are tucked inside your box. In keeping with the French theme, you will also find a Bohin pincushion, shipped directly from France just for you! Your new Clover Flower Head pins are designed for sheer fabrics, so store them in your new pincushion to keep them separated from other pins. (Due to their fine gauge, they are great for piecing accuracy, too!) Gutermann’s cotton 50 wt. thread is included in a teal that will blend with both of Katarina’s fabrics (which, by the way are from her Skopelo line). These fabrics are 60” wide, which is perfect for a mobius scarf. Other great fabrics for these scarves include rayon, minkee type fabrics (for colder climates and outer wear), and jerseys. Experiment with substrates and share your creations with us on facebook and instagram (@maxiemakes). Be sure to use #maxiemail when you post! Thank you for your subscription! Happy sewing and God bless! Welcome to October’s Maxie Mail Tutorial! Today’s project is a lined, zippered tote, adorned with English Paper Pieced (EPP) Hexagons and topped off with a hexi zipper pull. Made with fabrics from two lines by Bonnie Christine for Art Gallery Fabrics, I chose colors that speak of the Fall season. There are three videos: (below) the main pouch construction video, the English Paper Piecing video which outlines my preferred methods, and a short video for the zipper pull (hardware is inside your box!). I’ve been anticipating this month for quite some time and tried to time its arrival so that you might enjoy creating pouches, with or without EPP, in any size for your gift giving this Christmas and beyond! As for the EPP, I offer options for those hexagons, including a “no-sew” method for those that must skip the hand sewing. And because I’m not a fan of whip-stitched English Paper Piecing, (because stitches are visible on the front) I use an invisible stitch, as shown in the video below. I hope you’ll give it a try! Please watch for an email from me in the coming week that will include a brief survey for your opinions and wishes for future Maxie Mail boxes! Thank you for sewing with me today. Blessings to your sewing room, Maxie. I have two videos for you this month (below!) so, get ready to have fun as you dive into this month’s Subscription Sewing Box! Raise your hand if you love using math to accurately calculate cut sizes for quilt block patches without fear of having to toss the finished block into the orphaned quilt block pile. Me neither. Two “M” words that aren’t usually used in the same quilting conversation are “Math” and “Magic”, but today I’m bringing you not one, but two, magic tricks from the Math Whisperer herself, Cindy Williams of Onion Mountain Quilts and her blog, The Math Whisperer. Cindy has authored several quilting books, available on her website, packed from cover to cover with charts of equations and formulas, along with beautiful quilt patterns that you can easily grasp, thanks to her simple to understand instructions. You’ll get a taste of her style in this month’s box, because she created our pattern specifically for us, pulling it directly from her book titled Wait…What?, a book of ten quick piecing techniques. So make that tea, sit back and enjoy the magic show! Then open your box and create a little bit of magic of your own! Download setting instructions for your quilted pillow top here. You’ll find the video password on the pattern inside your box. I’ve included fabrics & batting to make a quilted pillow front, 1/2 yd fabric for the pillow back and necessary tools to create your star blocks as Cindy teaches in her pattern. I like to offer alternate ideas for your finished project, and if you’ve subscribed for a while you’re probably getting good at that game, too. The video below shares my method of sewing an envelope style pillow back, but you might like to use that fabric as a quilt backing and binding. Or, you might choose to make a long table runner, (placing the four star blocks in one row), or use the quilted pillow front as a bag front and the 1/2 yard to complete the bag and handles. Use your imagination, but whatever you do…MAKE THESE STARS! You’ll love learning these two techniques that you’ll use over and over again in your sewing room. View my easy Envelope Pillow Back tutorial below - no password needed. Thank you for subscribing to Maxie Mail! I hope you enjoy this month’s project and stow away those techniques for many future projects! August 2018 - The Tony Danza Mini Quilt! Tony Danza Mini Quilt 16" x 20"
Hello, August members! This month brings a project made from Bonnie Christine’s newest line for Art Gallery Fabrics, Gathered. As you know, Art Gallery Fabrics manufactures one of the best quilting cottons in the industry, using 100% Pima Cotton. Gathered, with its soft, rich hues evoke a feeling of late summer and autumn and will be a perfect accent for your fall decor! When polling my earlier subscribers for project ideas they wished to see, one request came up several times: Paper Piecing! So, when I planned to offer a paper pieced project I knew right away that I’d call on my good friend, Sarah Overton, of mycrowdednest.blog to bring one of her fun patterns that incorporates her technique of using templates to achieve a stress-free (and no waste) experience! You will enjoy this fun, easy method of paper piecing, so join Sarah and me in my sewing studio as we walk you through every step of the way! (See video below. You'll find your password on the card inside your box!) Note: Your Tony Danza pattern has been emailed to you for your personal use, however, we've supplied all the papers you need inside your box! I’d like to take a moment to thank you for your subscription to Maxie Mail! To my delight, we started with a good number last October, and over the last few months, our subscriptions have continued to grow substantially. We have always cut our fabrics in-house (I’m ever the control freak) but cutting was becoming not only very time consuming, but physically hard! I began to consider out-sourcing this portion of our box and, through references, I found a service that cuts for many major fabric companies. I hired them for our August project. Thankfully, I ordered over-sized pieces because I am less than 100% satisfied with their cuts. You will not have any problem cutting and sewing your project as ample is supplied in your box; you have more than the required widths on each piece. Please view the video tutorial for a cutting demonstration. It is important to me that you know that you can expect your future boxes to arrive filled with the same quality products and fabric cuts that you have been accustomed to receiving. Gathered fabrics for your quilt top and binding, by Bonnie Christine for Art Gallery Fabrics. 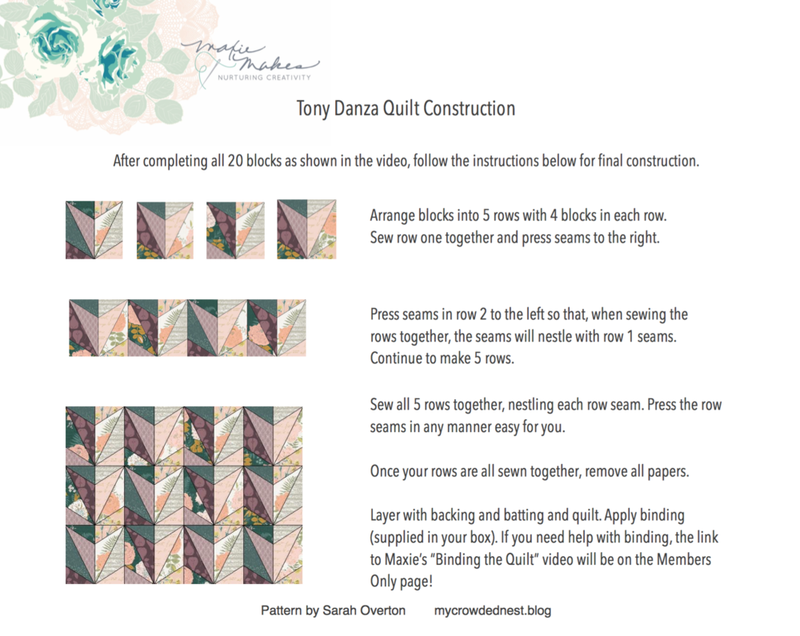 In addition to the video tutorial, below, you can download Sarah's printable tutorial for the Tony Danza block here. Need help with quilt binding? Click here for my video tutorial and I'll walk you through the process, start to finish! July 2018 - The Orange Blossom Quilt! Hello, July Maxie Mail Members! I don’t know when I’ve been so excited to share a project with you as I am today! This month we are tackling the dreaded curved seam as we make Plum Easy Pattern’s “Orange Blossom” quilt! Don’t fear these curves, though, because they are sewn with a fool-proof technique using no pins whatsoever! And you have several options to consider as you complete your blocks; would you enjoy a quilt, or pillows, or maybe a table runner? I’ve known the owner of Plum Easy Patterns, Deborah Miller, for years and became friends with her through my former quilt shop owner days. (You may remember her from our February Maxie Mail, “Folded Star Hotpad” and Prairie Points!) Deborah’s background in graphic design results in beautifully written patterns and this one is just the kind of project I’ve came to expect from her! Orange Blossom didn't disappoint me in the least! I handed off a Maxie Mail box to my friend, Sarah Overton, of My Crowded Nest and you’ll love seeing what she’s created with her Orange Blossom blocks! In case you decide to follow her lead, she’s posted a tutorial for her beautifully finished pillows on her blog. You’ll enjoy learning her unique zipper closure technique. Need help with quilt binding? Click here for my binding video (no password needed) for tips to enhance accuracy and speed. Sewn with Art Gallery's 100% Pima Cotton Pure Elements solids, you'll love the feel of working with these fabrics! And the binding fabric provided in your project box is also Art Gallery Pima Cotton, designed by Bonnie Christine. Want more? Click the image at left! Want additional Cut Rite Heavy Duty Freezer Paper? I offer the 8.5" x 11" sheets here. Want more die-cut Orange Blossom Freezer Paper? You'll find a set of 10 papers at Plum Easy Patterns. Deborah's papers are identical in size and brand to the papers I cut for you. June 2018 - "Hold it...You made that cute bin?" Hold it Bin, shown in Bari J's fabrics. Alternate fabrics for outer and lining, if you like for a co-ordinating set, or make them both the same! Hello, June Maxie Mail Subscribers! You are in for a treat this month with a project designed by book author, pattern and fabric designer Dana Willard! In case you’re not familiar with Dana’s work, you’ll want to check out her blog and YouTube channel filled with sewing and quilting tutorials. One of my favorites is her “Hold it Bin” pattern, and we thought you would enjoy it as well. There are two short videos (below) for you to watch; view mine first, as I share your box contents, pattern information* and three helpful tips demonstrated to help you with the construction of this month’s project. You’ll see a loads of inspiration, including about ten different finished projects in various sizes! So watch it until the end and then watch Dana’s for complete, step-by-step instructions! Not only will you love learning the techniques from both videos, you’ll also love using these useful, beautiful bins! *You will receive Dana’s 80 page pattern/book in an email on June 26, sent from maxie@maxiemakes.com to the inbox associated with your Maxie Mail account. Because of its size, you’ll want to save it to your computer or a flash drive. In my video you'll learn which pages are important to print (there are only 4! ), and the rest may simply be read from your computer screen. You do not need to print a pattern to make these large size bins; simply follow Dana’s easy cutting directions. She has included printable pattern pieces for 14 sizes, however, so I’m sure you’ll want to print your favorites! Small Organizer Hold it Bin, shown in Bari J fabrics. Art Gallery 100% Pima Cotton Fabrics to make a set of two co-ordinating Hold It Bins! Fabrics vary in each box, but are from either Bari J, Katarina Roccella, or Sharon Holland collections. *Please note that Dana Willard’s pattern was individually purchased specifically for you and legal copyrights apply. Please do not share. Be sure to post your photos, and tag @maxiemakes and #maxiemail and #holditbin on Instagram & Facebook. No passwords needed to view videos this month! May 2018 - Cool Tools! Hello, May Maxie Mail Members! "Use it up, wear it out, make it do, or do without!" I know you've all been waiting for this specially curated box of sewing notions and tools, and I've worked for months gathering items that I felt would you would use up, wear out...and replace because you just can't do without! Owning fabric shops for over 15 years, I never offered gimmicky products because I valued being trusted by my customers to provide quality items that made their sewing easier, more efficient and accurate. When a new notion arrived on the scene I ordered just one to test; they either wound up on my notions wall or in my waste-bin! Everything in your box has passed my test, and you'll see how to use all of them in one project in the short video tutorial below! Next month we will be back at our sewing machine with a fun project and a guest designer from Art Gallery Fabrics! Klassé Needle Assortment with 10 packages of premium sewing machine needles. Visit their website for lots of downloadable helpful tips and charts for proper needle sizes to threads, etc. Aqua Eraser Pen by Sew Line was introduced to me by my longarmer friend and cohort, Andrea Walker of Walker Quilt Company. We've both seen sad stories regarding marked quilt tops. Your Clover marker & Aqua Eraser Pen get our votes for safest and most reliable! Good news: it's refillable with water! Tulip Hiroshima Sharp Sewing Needles are more expensive than regular needles, but well worth it! They are the best sewing needle made because of the Japanese engineering designed into the needle. It is polished lengthwise with tiny, invisible grooves, resulting in less needle contact with your fabric, but that's just one of it's many features. Visit their website to read more, and to view a fun tour of the factory, click here! Thread Magic Thread Conditioner reduces thread drag, tangling and hand fatigue! Pair it with your Hiroshima needle and you'll be sewing at supersonic speed! Gypsy “Rip It Away” Seam Ripper, another time saver has become my favorite seam ripper for removing straight seams. See it in action in my video below. April 2018 - Tube Method Sewing! Hello, April Maxie Mail members! I hope this month's project will lead you to venture into some new sewing frontiers in an unconventional way! Maybe you've made pillowcases in the past with the "Tube Method", but did you know that you can use this method for a variety of other things? If you aren't familiar with this technique, don't worry! I'll walk you through every step with plenty of tips along the way in this month's video tutorial (scroll down to view). Then I'll show you four more types of projects made with this very same fascinating means of creating a finished, enclosed hem. We will make a matching set of two pillowcases with the fabrics included in April's box, which also includes the new "Splash Rotary Cutter", thread, pattern and a few delectable goodies! Please remember that your subscription is not only for a monthly project and supplies, but for the accompanying instructional video as well! 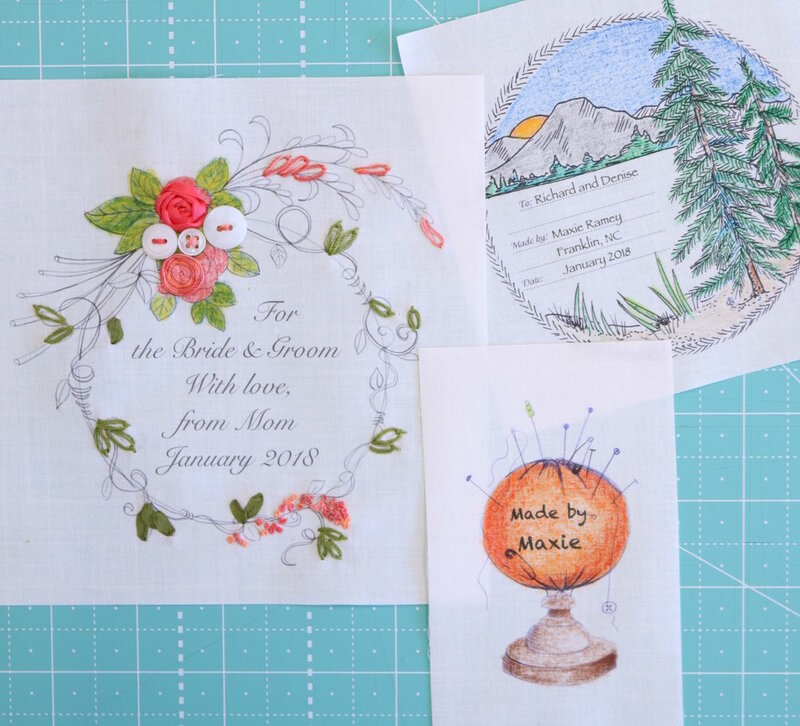 There you will always find numerous tips and techniques that can't be printed on paper patterns, and that's why Maxie Mail is "A Class in a Box"! I'm with you, right there in your sewing room! Enjoy! I wanted a soft, romantic feel for this month's project, and no one does that better than Verna Mosquera! Want additional Pillowcase Kits? Click here! The pattern for the apron shown in the video will be posted here later, so stop by soon! March 2018 - Strippy Aunt JOsie...with a bonus project! This month’s box is packed with 5 gorgeous fabrics and all the items necessary for creating this fun little string block quilt. 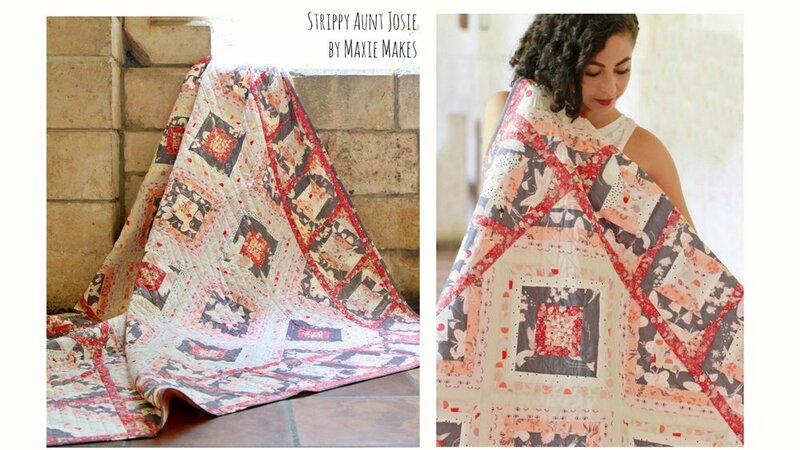 The inspiration for this quilt comes from a string quilt I found in my mother’s possession, made by her Aunt Josie. Most string blocks are made by piecing strips onto a muslin foundation square, which is not only time consuming, but leaves the quilt heavy with the extra layer of fabric inside. I set out to streamline the process using strip sets without a foundation, resulting in a faster, lighter, more accurate (foolproof) method! And a little bit of frosting on this cake is that a bonus project is included, made from the cutting scraps! I hope you enjoy this process as you create not one, but two mini quilts! View the video and grab a couple of downloadable .pdf files for different options below! Look for your video password inside your box, on the front cover of your pattern! If you’d like to increase the size of your quilt using 4” blocks, you’ll find additional fabric packages here at the cost of $16.99. Each package yields 18 blocks, with 36 side triangles for bonus blocks, and 9 bonus blocks. 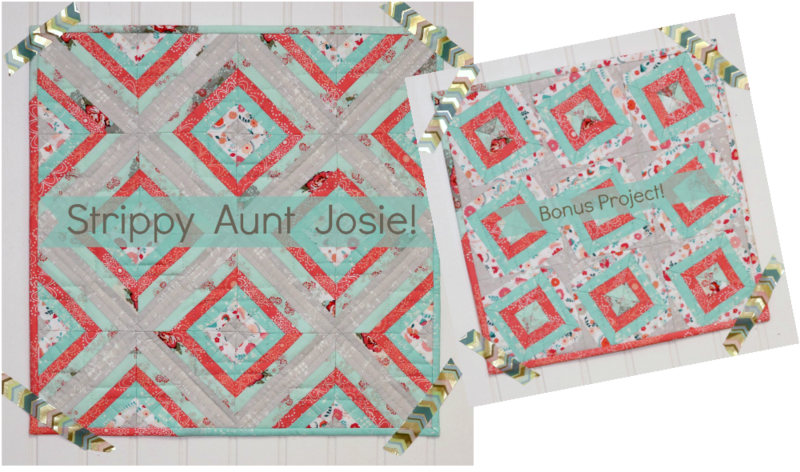 Keep those bonus blocks in mind, because they can be added to the sides of your quilt or made into a separate quilt. You'll see the strip arrangement in your pattern and also in the video, but if you'd like to see how different your quilt will look with alternate strip set arrangements click here! The setting style shown above is outlined in the video and pattern, but if you'd like to see different setting styles for your Strippy Aunt Josie blocks click here! Thank you for your referrals during “February Friends - Share the Love” subscription days! Both the referred and the referrers will find double fabric inside this month’s box! Prairie Points have certainly been around the block, no pun intended, but in this month's box we are bringing them into new light with Deborah Miller's Folded Star Hot Pad Pattern. I've made lots of Folded Stars over the years, but Deborah has transformed this staple unit with a fresh technique that I think you'll enjoy learning. In your box you'll find a kit with pre-cut fabrics and other supplies you'll need to make your own beautiful Folded Star project. With zero cutting and minimal sewing, you’ll be finished with your project in record time! Just open the box and dive in! Note: Please note that the video passwords are no longer on this website, but are packed in your Maxie Mail box. You’ll find this month’s password on the fabric key sticker on your Folded Star kit. The only video you’ll need the password for is the Prairie Point and the Folded Star video. The Continuous Prairie Point video (both videos are below) needs no password. Folded Stars would be beautiful on a variety of other projects, for example, a bag front or a pillow front. You’ll find 6 additional templates included in your box this month, so use your imagination and please tag Maxie Makes on Instagram and Facebook to share your creations with everyone! In addition to Deborah’s Prairie Point method, I’m sharing an additional video that will teach you how to create Continuous Prairie Points. This method yields 42” of connected points from one strip of fabric! You’ll find both videos below. Want more kits like the one in your box? You’ll find them here. Want the Prairie Point Turner by Susan Cleveland (shown in the subscriber's video)? You'll find it here. Want a complete box for a gift for someone else or a for yourself? Subscribed members may purchase current and past boxes (based on availability) here. January 2018 - Fun With Labels! “Don’t let your quilt story fade away"...a quote from quiltalliance.org. "Document, Preserve, Share". Another quote from the Quilt Alliance Website. Michael Newman is the founder of Story Patches, the company that made our special QR Code quilt label. Also a member of the Quilt Alliance Board of Directors, Michael's mission is to help us document our quilts and projects in meaningful ways. For more information about how to use your QR Code label with your smart phone or iPad, be sure to watch the video below, and click here for easy instructions. Not sure how to use that great CD in your box? No problem, just watch the short video below and watch as I load designs from the CD into my word processor and add text, resize and print! No password needed, just click and enjoy! Note: the stkr.it website, which is a sister website to storypatches.com, sells QR codes that you can download and print! They are only $.99 for twelve (12) codes, so why not purchase them and print them on labels from your Quilt Label Collective CD! Simply add them as an image to the label in your word processor! Click here for a .pdf file of tips for using your QR Code label. Want to order more supplies? You'll find Electric Quilt Printable fabric, the QR Code label and additional January boxes on my shopping page. Don't you think the January box would make a great gift for another quilting friend? I have a limited supply on my website, and they are offered to subscribers only, at the regular subscription price. This month's box includes a beautiful little quilt made from Art Gallery fabrics, designed by Bonnie Christine. This line, "Hello, Ollie" is 100% organic cotton with a most luxurious feel! I've enclosed everything needed for the top and binding, plus a few other necessary notions and goodies. You've no time to make a quilt and bind it? No problem! 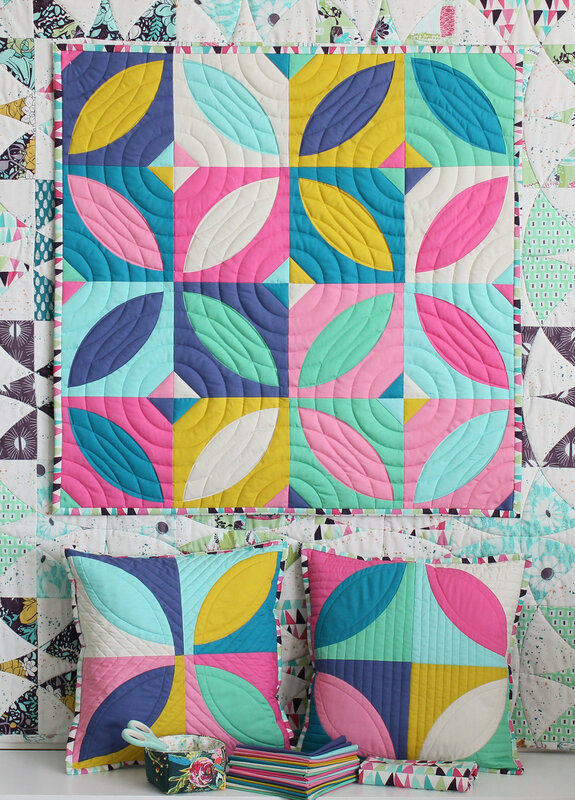 You can choose to make this quilt in one of two ways: 1: traditionally pieced and quilted, and finished with binding on the edges, or 2: traditionally pieced, turned and tied with no binding! The video features the tied version, which I made in just one evening! Please watch the video before deciding which version you'll make...I think you will fall in love with tied quilts if you give it a try! Need help with binding? This month features a bonus video tutorial, "Binding the Quilt", included below the Dabbling Swan Quilt Video. This video is not password protected and will always be accessible with future boxes featuring quilting projects. Bonnie Christine also designed a beautiful cotton Tea Towel that coordinates with her fabrics, and I've tucked it inside the box, too! Whip it into a matching pillow in a matter of minutes to compliment your quilt! You'll find your bonus content for November below, which includes a video tutorial, a printable file of various quilting designs for your pillow and a printable file of your pattern. This month you'll learn fusible free-motion appliqué, free motion quilting (with your new gloves!) and how to construct an envelope pillow. Let's sew together! I hope you enjoy making your Buck Forest Pillow as much as I did! Thank you for subscribing! Enjoy! Need quilting ideas for your pillow? Click here to download my ideas! Want to download the pillow pattern to your computer? Click here to download the pattern. Want more Buck Forest Appliqués? You'll find them here! A ceramic mug, designed especially for our box by Bonnie Christine. Matching fabrics, also designed by Bonnie Christine, to make the Hexagon Mug Home. And, if you were an early subscriber, a gift package of my favorite flower head fine pins are included for you! Want a couple of great recipes for your new mug? Click here to download a couple of my favorites! Want some quilting ideas for your new mug rug? Click here to download 5 suggested designs! 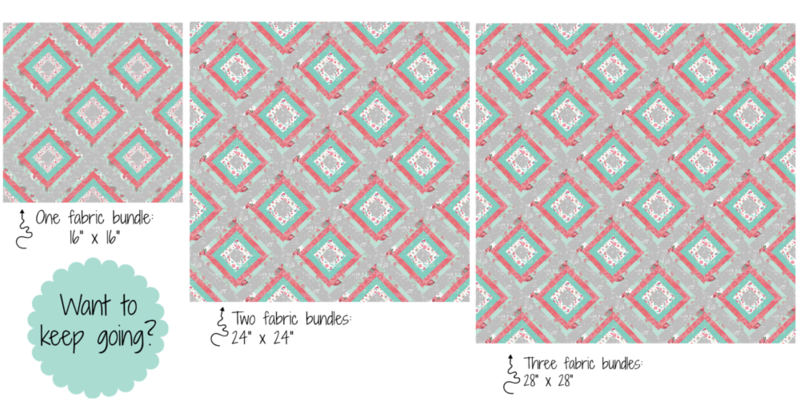 Want to keep the Hexagon Mug Rug pattern on your computer? Click here to download the pattern! Thank you, again, for subscribing to the Maxie Mail Subscription Sewing Box! Let's sew together!